Surprise! Another religious huckster exposed for his huckstery. Can't people just do good works without trying to throw in the magic stuff? 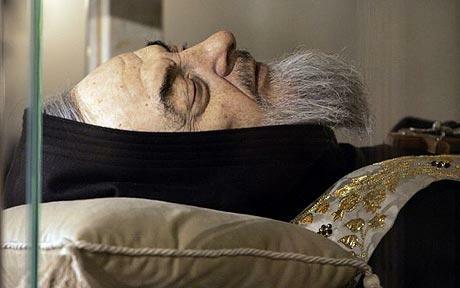 Italy's Padre Pio used carbolic acid to cause bleeding wounds on his hands that he claimed were replicas of Christ's, according to a new book. Pio, a former monk who died in 1968 aged 81, wore gloves because his hands bled constantly for 50 years in what were revered as stigmata wounds. He became Italy's most loved saint after he was canonised by Pope John Paul II in 2002. But a new book has heaped more scorn on the claims that his wounds were duplicates of those suffered by Jesus during the crucifixion. Italian historian Professor Sergio Luzzatto has discovered documents including a letter from a pharmacist who arranged carbolic acid for Pio. His claims were dismissed by the Catholic Anti-Defamation League in 2007. Pietro Siffi, the president of the League, said at the time: "We would like to remind Mr Luzzatto that according to Catholic doctrine, canonisation carries with it papal infallibility. Need more of that papal infallibility?